To be honest, the passion fruit that I managed to find (some from the supermarket and some from the local wet markets) were pretty sour. Apparently it's supposed to be sweet as well and you can just scoop it out and eat the sour sweet flesh. Uhh...not gonna happen with this batch we got. The passion fruit pulp was as sour as a b***h until we added enough maple syrup and then...it was something else. Delicious, unusual, alluring, aromatic... My little daughter kept asking for more of the 'orange stuff with the black eyes' for days afterwards. But her mama (that's me!) had other, loftier plans for this little sour surprise. Homemade ice cream, anyone? Our homemade passion fruit ice cream turned out smooth, deliciously tart and fruity, peppered with delightfully crunchy bits here and there (the lovely black seeds). It was a perfect digestivo! Did you know that in the old food days of Europe, refreshingly tart sorbets were served as a palate cleanser after each course?! Well, I think that was a great tradition! (And we should reinstitute it!) I just love the way Europeans approach their food and their eating. It's just so civilized and yet at the same time so lusty! By the way we discovered that this Passion Fruit Ice Cream needs to be allowed to ripen. The first day we tried it, it was delicious but still packed a pretty sour punch on the first bite. (cue: pucker face) But by the third or forth day the flavors had mellowed out to a perfect sweet sour tartilicious balance. It's so good we just can't stop eating it! Yummilicious! Tip: When buying passion fruit, look for the really wrinkled ugly ones. The wrinkles mean that the fruit is very ripe, which is good, it will be sweeter. Check the weightiness of the fruit, if it's too light it's probably dried up inside (guess how I know that...) Shake to feel and hear for the liquid mass inside. Sniff it, it should smell aromatic and fruity. 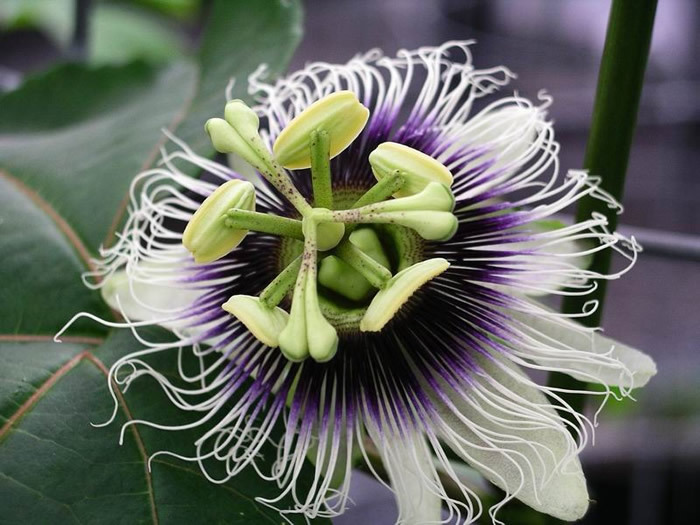 The Passion Fruit Flower , isn't it gorgeous?! Heat cream, milk, sugar in small saucepan until warm. Whisk egg yolks separately. Very slowly drizzle the warmed milk mixture into the egg yolks, stirring constantly to incorporate. Pour the milk egg mixture back into the saucepan, turn heat to medium. Stir constantly, scraping sides and bottom until the mixture thickens enough to coat the back of your spoon. Turn heat off, strain custard into a large bowl. Add the passion fruit juice and stir. When completely cool, put in your refrigerator to chill and make ice cream with your ice cream machine. Remember to add the passion fruit seeds at the very end of the mixing. When the custard is completely cooled down, cover and put in the freezer. After 45 minutes, take out and stir up everything with a wooden spoon, making sure to completely break down any ice crystals with your stirring. Cover and freeze again for 45 minutes. Repeat stirring as before. Cover and freeze for 30 mins. Repeat stirring. After about 3 hours total, your custard should start to become a consistency more like really soft serve ice cream. At this stage, mix in your reserved passion fruit seeds, pour all into your ice cream storage container and let freeze overnight.